Bret Taylor is no stranger to being the underdog. From a scan of his resume, this may not seem to be true: MS in CS at Stanford; joined Google in 2003 and helped lead the team that co-created Google Maps; co-founded and was CEO of FriendFeed, which was successfully sold to Facebook in 2009; became CTO of Facebook until 2012; and finally co-founded and is currently CEO of startup Quip, which recently raised $30 million from Greylock and Benchmark. In fact, to most people, it would seem like Taylor has had a career of working for some of the largest, most powerful tech companies in the world — a career of being a “Goliath,” you might say. But to hear Taylor tell it, the more common thread within all of his experiences building products has been being a “David” — the tiny upstart trying to take down a very established competitor. He may have ended up building what are now regarded as incredibly successful and trendsetting products, but in almost every case, according to Taylor, each product started as series of failed experiments trying to dislodge well-established rivals. “I think I’m personally driven to ‘fix’ product experiences that seem backwards or antiquated, which seem to be by-products of industries with heavily entrenched competition,” Taylor says. 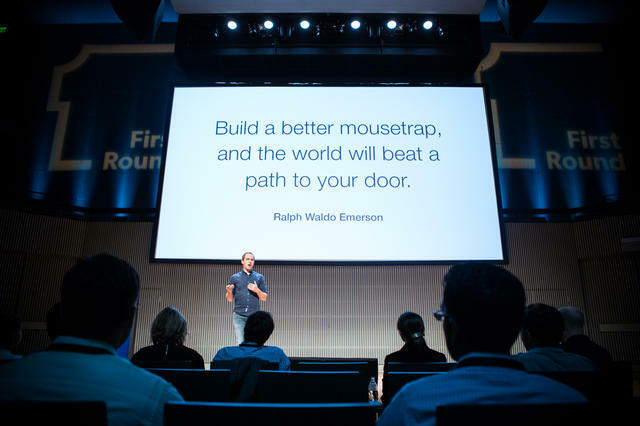 At First Round’s CEO Summit, Taylor distilled his key lessons and tactics from building many products in competitive markets and successfully taking on entrenched competitors. Coming out of Stanford, Taylor deeply believed that product quality leads directly to market success, and his first job out of school at Google reinforced that view. 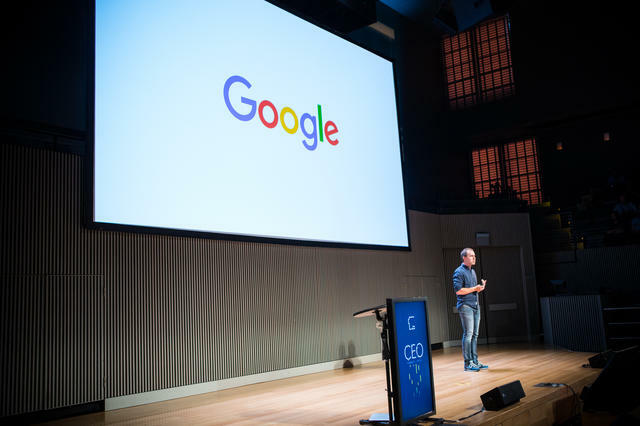 “There was widespread skepticism about Google when it was released — sure, it was a better search engine, but would anyone care? There were tons of other search engines at the time. And why would people use a dedicated search engine when search was built into the the most popular portals on the internet like Yahoo and Excite? But sure enough, Google was a much better product, and it did win.” Google was a company built on the premise that the best product wins, period. For young product managers like Taylor, this cemented the idea that if you could build a better mousetrap, it would always win. Taylor says that he has taken this path unsuccessfully multiple times in his career — focusing on building a better mousetrap when that alone was almost certain to fail. But as he examined the process of designing and building all the failed products, as well as the ultimately successful ones, he discovered a common pattern. According to Taylor, the biggest problem with the “better mousetrap” theory of development is that it ignores the unique strengths of the incumbent's products that you're competing with. 2) Habits die way harder than you’d expect. In many ways, your quietest, most steadfast competitor is indifference. 3) Just being different isn't enough. Your customers have to care. The main problem startups face when taking on a strong incumbent is differentiation. The hard part about differentiation is not making something different, but getting your potential customers to appreciate that it is different and better before they actually make a purchasing decision. It turns out that it’s way harder than it looks. When Taylor first arrived at Google, his boss, Marissa Mayer, asked him to tackle a seemingly simple idea: Local Search. Local Search was different than Google’s well-loved web search engine. It wasn't just a search query, but a search query and a location. The things you wanted back were different — rather than just wanting a list of web pages, you might want the phone number of a restaurant to make a reservation, or directions once you found out where the restaurant was located. Google's insight was that the web was filled with content about local businesses, and Google was extraordinary at mining the data on the web. Taylor’s team decided to build a local search product around this concept. With Search by Location, according to Taylor, you’d search for “coffee in San Francisco,” and you’d get a bunch of web pages talking about coffee, but no actual coffee shops. Worse, if you searched for “coffee near Menlo Park,” all you'd get was Sun Microsystems web pages. Sun happened to be headquartered in Menlo Park, and the company’s web pages were riddled with coffee puns thanks to Sun’s popular Java programming language. Taylor's team combined a structured database of Yellow Pages data with Google's extensive web index so that when you found a business, you'd see every web page that had ever mentioned it, including its homepage and a bunch of reviews. “You could even search for details like an item on a menu, and it would match the restaurant,” Taylor explains. But as you’ve probably guessed, it didn’t quite happen that way. Google Local was better because it let you search for anything — not just the name of a restaurant, but details in its menu, and it would return great results. But, despite this power under the hood, on the surface, it actually looked a lot like Yahoo Yellow Pages. Because users were so stuck in their habits from Yahoo, they couldn't tell that the product was better. Because people’s behavior hadn’t changed, our differentiators didn’t actually matter. For Taylor, Search by Location and particularly Google Local — the two predecessors to Google Maps — are perfect examples of the fact that even products that are better can fail in the face of strongly entrenched incumbent products with well-defined habits and expectations. 1) Familiarity can be a fatal weakness. In Google Maps, people were using all the features they ignored in Google Local. 2) You have to make your users a little uncomfortable to make “better” matter. The new interface encouraged the kind of exploration that the stagnant, incumbent competitors trained users not to attempt. The bottom-line is you have to build a lens to allow users to see a new world rather than features to help them see an old world better. Taylor and his co-founder, Kevin Gibbs, started Quip on the premise that the way people worked has fundamentally changed over the past decade — people aren’t opening up a Microsoft Word and writing memos on virtual 8.5 x 11 sheet of paper anymore, and teams are moving away from email to more modern forms of communication like chat. As a consequence, Taylor says, the customers who really “get” Quip have documents that are completely different than the documents they had in the last generation of products: rather than memos and contracts, they're creating team checklists for project management, spreadsheets to track recruiting candidates and editorial calendars, and year-long documents full of weekly meeting notes. Taylor and the team went back to the drawing board to try to reframe the product in a way that distanced Quip from the old behaviors. Rather than making spreadsheets a separate type of document like it is in every other product, the Quip team made it a component that you can embed inside of any document — sort of like a really powerful table. “All of a sudden,” Taylor says, “people’s feedback changed — because their expectations changed. When they opened Quip, rather than trying to recreate the experience they had in Excel, they were creating new experiences. We had a growth engineer embedding a mix of screenshots, analysis, and spreadsheets to track a growth experiment.” The same family member who had complained about the lack of pivot tables complimented Taylor on how powerful these new tables were in Quip for tracking RSVPs for an event. Just like with Google Maps, by presenting people with an unfamiliar experience and making them a little uncomfortable, their behavior changed, and they used all the differentiated features the Quip team built.